Removable partial dentures are reccomended to replace multiple missing teeth in some cases. A removable partial denture is an appliance that is removed daily for cleaning. 1) All Acrylic Temporary Partial. This is a hard plastic partial denture and is used in transitional situations where teeth have been recently removed or lost due to accident or injury. While this type of partial is less expensive, it is also weaker and does not have as much retention as the other types of partial dentures. 2) Metal Frame Removable Partial. This is the most common type of removable partial denture. 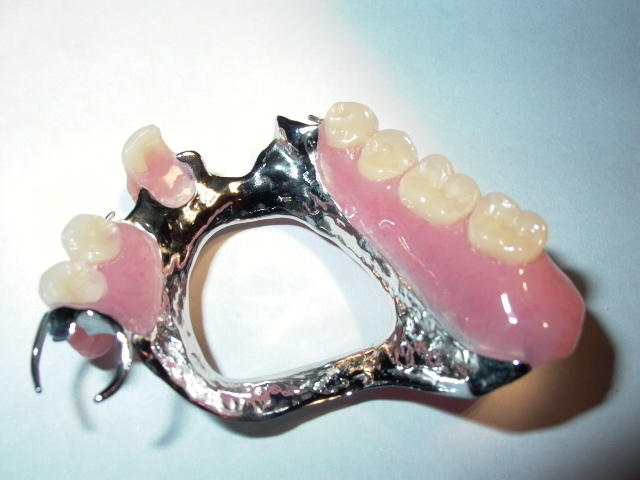 It has a cast metal frame with metal clasps holding it in and areas of acrylic holding the denture teeth. This type of partial is very strong and reliable. The main drawback to this type of partial is the metal clasps making it less cosmetically pleasing. 3) The Flexible Acrylic Partial. 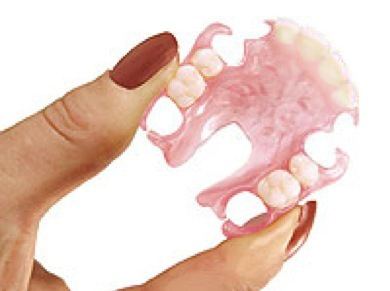 This newer type of partial denture combines the cosmetics and lightweight of no metal with the strength and durability of a metal frame appliance. Occasionally the alignment of the remaining natural teeth will prohibit the use of this kind of partial.